A bringing together of the key elements of previously delivered Bodii training concepts and techniques, by again going that extra step towards the ultimate in strength, fitness and sports performance. A position where the guiding principles outline options for overcoming/minimising some serious training and athletic injury scourges. Also contains innovative performance alternatives for many commonly recognised strength and fitness exercises, and advanced proprioceptive systems for willing participants to enhance both their adaptations and understanding. Consolidating Bodii concepts and techniques. Additional Bodii concepts and techniques. The concept of Concentric Muscular Activation. Concentric muscular activation - Method 1. Concentric muscular activation - Method 2. 1. The multi-directional profiles of Effective Load. Example: Bodii upright row at cable machine. 3. Posterior and anterior crossed-over Effective/Midline Load. 1. Structural stabilisation and strength. 3. Cable-harness profiles in bridge positions. 4. Bodii cable-harness cardio training. 5. Individual cable machine at multiple profiles. 2. All inclusive calf/active lumbar curve. 3. All inclusive adductor/back extension. 5. All inclusive quadriceps/hip flexors. 8. All inclusive core & curve. Bodii views & variations to: traditional quadriceps isolation exercises. Leg extension and its effect on the structure of the knee. 1. Altering the shape of traditional leg extensions. 2. Bodii variations to leg extensions. a) Standing kettlebell leg extension. b) Seated core-ball kettlebell leg extension. c) Seated core-ball leg extension at lying leg curl apparatus. d) Core-ball leg extension using various resistance modes. e) Cable cross-over & chin-up harness leg extensions. Bodii views & variations to: traditional hamstrings isolation exercises. The Peripheral core muscles and their role in Leg curls. 1. Altering the shape of traditional lying leg curls. 2. Bodii variations to lying leg curls. a) Prone 45cm core-ball leg curl. b) Standing single leg core-ball curls. c) The inverted, multiple core-ball leg curl. d) Lying leg curls in prone core-ball bridge. e) Supine core-ball leg curls. 3. 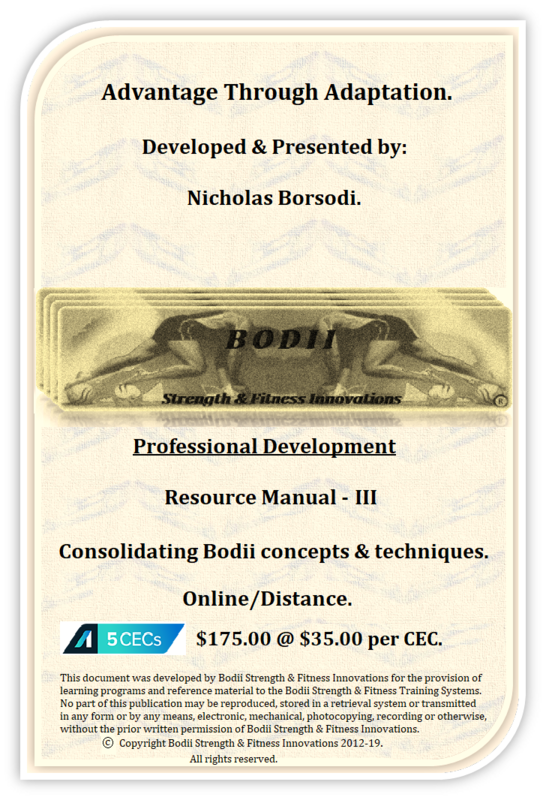 Bodii principles governing hamstrings conditioning. 4. Assessing hamstrings flexibility/tightness issues. 5. Strategy to relieve hamstrings flexibility/tightness issues. Some Bodii variations to traditional exercises. a) 45cm core-ball to bench push-ups. c) Three core-ball push-up with incline. e) Push-ups with ballistic core. f) Push-ups using cable machine profiles. b) Dumbbell pullovers with pectoral squeeze. c) Cable machine profile pullovers. a) Static squat & hold. c) Bodii Smith Machine core-ball squat. b) Dumbbell triceps kickback (extension). c) Triceps kickback with Effective Load. d) Triceps Effective Load & kickback-press. b) Dumbbell seated core-ball curls. d) Seated barbell biceps curl. a) Cable crunches on 25cm core-ball. b) Core-ball abdominal curls on gym bench. d) Transverse abdominis co-contraction, through contracting Rectus abdominis. Preview of Bodii Program IV.